As a farmer, when I think of glyphosate, I think of it as a tool. Glyphosate is one of many herbicides that I use on my farm to manage weeds. Glyphosate is popular in the media, and one of those reasons is because it is the active ingredient in the well-known product called Roundup. Just like the average homeowner can use a formulation of Roundup to kill unwanted weeds in their lawn or in the cracks of their driveway, I use a formulation of Roundup to eradicate weeds from my fields where I grow Roundup Ready corn, soybeans and cotton, as well as conventional corn, soybeans, cotton, peanuts, oats and grasses. Glyphosate is considered a safe herbicide due to the small amounts that can be applied to control weeds, as well as its low toxicity, and short life as an active compound in the environment. Just like any other tool, glyphosate has its intended uses. It's not the only herbicide, or the only chemical, that I use on my farm. The term "chemical" has become a dirty word, but that's simply not the case. Many people point out that dihydrogen monoxide is a commonly used chemical, and that's simply a water molecule. As with all chemicals, the dose is what makes the poison. When farmers use chemicals for agricultural production, we consider it an input, just like any other business considers inputs. Inputs require resources like money, time and labor. There is no incentive for a farmer to use more of an input -- or a chemical -- than is necessary to accomplish the goal for using that tool. It's important to keep an open mind when thinking about agrichemicals. They are an integral part of modern agricultural production, and chemicals are used around the world in all forms of production, including organic. For example, on my farm alone, we may apply atrazine, 2-4,D, glyphosate, dicamba, imazapic (which are all herbicides); permethrin (insecticide); and/or triazole (fungicide). We do not apply all of these agrichemicals to every crop or every field of a given crop. Depending upon the type of crop, the type of weeds present in the field, method of action (whether the chemical works by contact with a plant, insect or other organism like a fungus, or in the soil) and the residual of the chemical (which can keep the weeds from spreading seeds that will germinate after the chemical is applied). Glyphosate is usually associated with GM crops because it is the active ingredient in Roundup. A popular GM trait (trait means desired characteristic or "ability" for the plant to do something) is the Roundup Ready trait. Contrary to popular belief, a Roundup Ready crop does not contain or produce glyphosate. Most plants have what is called an EPSPS enzyme (humans and animals do not have this enzyme, so it doesn’t affect us!). Glyphosate affects this enzyme and keeps the plant from being able to survive. Roundup Ready crops have a trait that essentially "turns off" glyphosate's ability to affect this enzyme, so when glyphosate is applied to Roundup Ready crops, they don't die like normal weeds. It is also important to note that all GM crops do not have the same traits. The "GM" just describes how the traits are introduced to the crop. 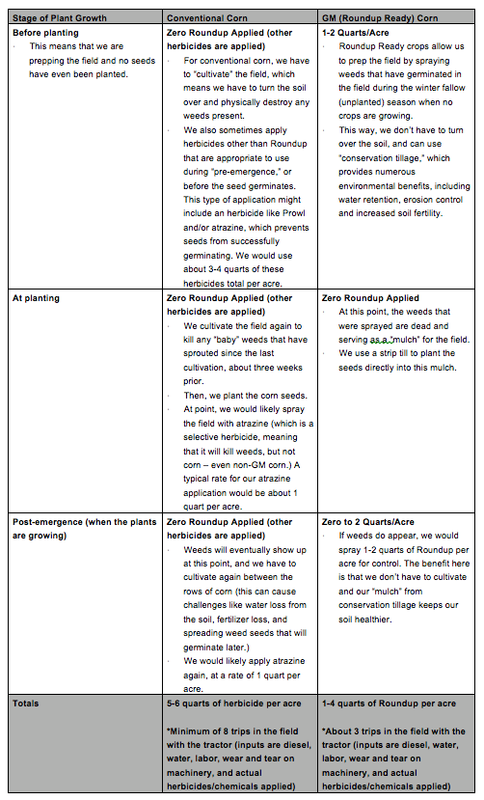 Back to herbicides -- how are they applied? Now that we've established what herbicides are and how they relate to GM crops, let's get into the nitty gritty of how farmers actually apply them in a farming setting. We'll use glyphosate as an example because it is a chemical that many people are familiar with. I'm going to take you through the process of how we plan for a glyphosate application of Roundup Ready corn (remember that there are several different types of Roundup Ready crops, not just corn) and conventional corn (conventional means that the corn is not GM and is not organic, just regular ol' corn -- and to complicate things further, corn grown on farms is actually a hybrid). We'll start with conventional corn (this corn does not live when glyphosate is applied to it). BUT FIRST – All agrichemicals (including herbicides, insecticides, and fungicides) absolutely have to be applied and stored according to EPA regulations. This is found on the pesticide label. Do not be fooled, though – this label does not look like a nutrition label on foods. It’s often several “pages” long and serves as a manual for how to safely, effectively and responsibly handle the chemical. This label includes what is called maximum application rates, which tells the applicator how much of a chemical can be used and during what stages of plant growth. The pesticide label gives a “maximum rate,” which tells the producer the absolute highest amount of chemical that can be applied. About 90 percent of the time, we apply much less than the maximum rate. You may be asking yourself, “Okay, so which is better – conventional or GM Roundup Ready corn?” That’s not a simple answer. I would say neither or both, depending upon the circumstances. None of these herbicides used on corn are especially toxic to humans, animals or anything other than the target plant species, or weeds. The major benefit I see as a producer to using a glyphosate-based herbicide regimen with Roundup Ready crops versus how we manage weeds in conventional crops is being able to use conservation tillage, and spend less time in the field. But, I still use both systems depending needs of each individual field on any given year. Conventional production has value. I’m going to step on my soap box a bit and say that we have to stop pitting one type of agricultural production against another. All of the products currently available on the market (chemicals, seeds, and other “tools”) have been thoroughly researched and evaluated for their safety, including impacts on human health and the environment. As a farmer, I have to make the best decisions possible, keeping in mind the needs we have for food production, and those human health and environmental safety factors. I live in the same world you do, drink the same water, eat the same food, and breathe the same air. I consider being engaged in agricultural production to be of the highest honor and responsibility. If someone else didn’t grow your food, what would your daily life look like? Chemicals used in agriculture are just like the chemicals you use every day – in household cleaners, in your car, in the substances that make up our buildings and the personal products you use. All agricultural producers have the same goal – to produce safe and nutritious food, using resources as efficiently as possible. We are fortunate to have the ability to even consider the safety of the chemicals that we interact with every day – or that we even have access to these “tools” at all. Food insecurity is not something that most folks in the Western world are familiar with, and that is largely due to the wide variety of tools available in agricultural production today. I personally am thankful for glyphosate.